The DVD itself is identical to the DVD in the lower-priced economy version, which comes in a small clear plastic case. If this movie happened to come to your hands whether from a friend or from a stranger, it means that you've been given a chance to think of and maybe find a better way of perceiving the social environment and reflecting on it. It might be an opportunity to expand on your realization of your own unique important purpose that is linked, in my opinion, to constant analysis of your behavior and enabling the voice of conscience to be heard. 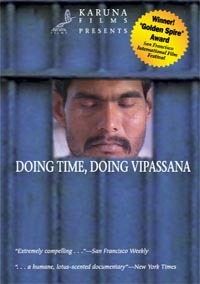 Vipassana is there for you to help in stepping toward a happier life. This movie has actually a great description of the process of becoming adept at meditation, as well as bringing Vipassana into the prison system. Highly recommended.